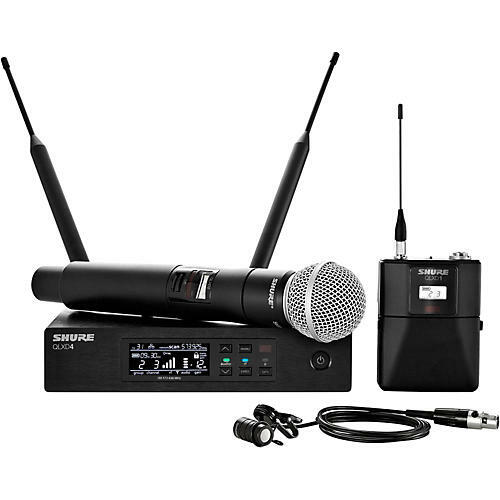 The Shure QLXD digital wireless systems are available in a variety of configurations that accommodate the needs of live presentation professionals from musicians to business leaders to auctioneers and beyond. This is the QLXD124/85 system, which includes the QLXD2 handheld transmitter equipped with an SM58 capsule, the QLXD4 digital wireless receiver, instrument cable, power supply, 2 AA batteries, two 1/2 wave antennas, 2 BNC cables, zipper bag, 2 BNC bulkhead adapters, rackmount kit, and user guide. The half-rack QLXD4 Digital Wireless Receiver quickly finds open frequencies and deploys them to transmitters via the one-touch sync function. The QLXD4 works with all QLX-D Digital Wireless Systems, and features Ethernet networking and mobile monitoring and control capabilities. With an interchangeable SM58 microphone cartridge, the QLXD2/SM58 Handheld Wireless Microphone Transmitter is ideal for wireless vocals in presentation spaces, music venues, and houses of worship. It interfaces perfectly with the QLX-D4 receiver. It offers up to 9 hours of continuous use with 2 AA alkaline batteries or up to 10 hours of continuous use with Shure lithium-ion rechargeable batteries, and comes with 2 AA batteries, battery contact cover, microphone clip, and user guide. The SM58 is Shure's most legendary microphone, world-renowned for its distinctive upper-midrange presence peak that ensures an intelligible, lively sound. Frequency response is a smooth, vocal-tailored 50Hz-15kHz. The Shure WL185 Wireless Lavalier Microphone is an electret condenser mic designed for use with a wireless bodypack transmitter. With a cardioid pickup pattern, the WL185 is recommended for sound reinforcement applications requiring rejection of ambient noise and a narrow pickup angle. The WL185 has a 4 ft. (1.2 meter) cable terminated with a miniature 4-pin mini connector. Included tie clip can be rotated in 90 degree intervals for placement flexibility. Use of windscreen highly recommended. Narrow cardioid pickup pattern for noise rejection. Four foot (1.2 meter) cable terminates in a miniature 4-pin mini connector. Included tie clip can be rotated in 90 degree intervals for placement flexibility. Pickup angle is 130 degrees. Receiver: 7-3/4 x 6 x 1-5/8"